Lowest Prices for the best wiring from Bargman. 7-Way Super Sealed Connector w/4' Cable - Car End part number 50-87-004 can be ordered online at etrailer.com or call 800-298-8924 for expert service. Establish a secure connection between your towing vehicle and trailer with this 7-pole, RV-style socket. Metal socket has non-corroding, shock-resistant interior design that eliminates shorting out and is color coded to RVI standards. This heavy-duty trailer connector socket has an outlet for a 7-way plug. A weatherproof, insulated lid covers the terminals. The cover is also easy to open and extra-durable. Today we're going to review part number 50-87-004. This is the Bargman 7-Way Super Sealed Connector with the four feet of cable. This is for the car end, this will give you a seven way car end connector on your vehicle and, again, the length on this is four feet. On this end is the pigtail wires that would be wired to the vehicle. 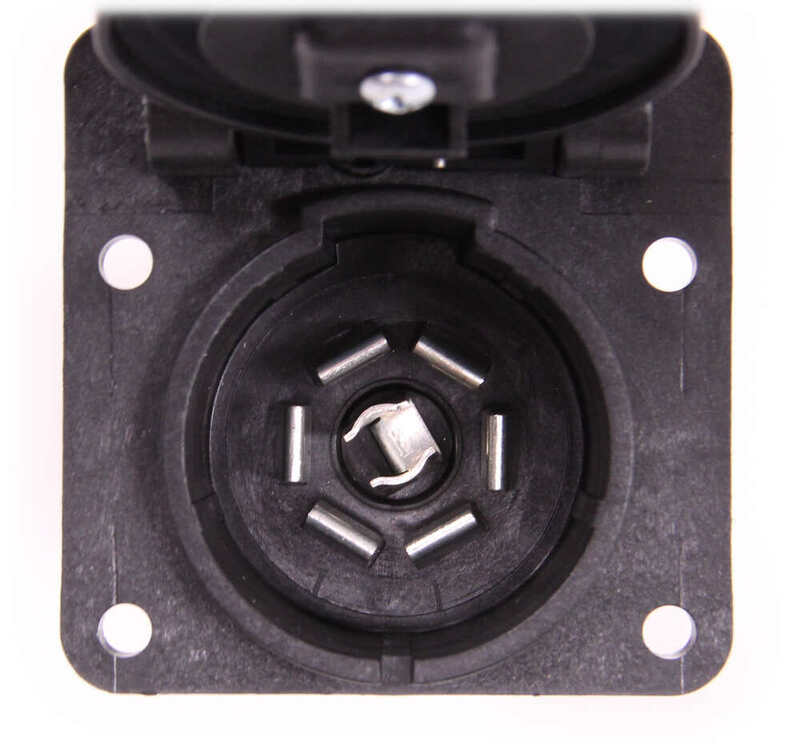 This seven way has a nice spring-loaded cover that helps protect the terminals form any elements or bad conditions. That should do it for review on part number 50-87-004. This is the Bargman 7-Way Super Sealed Connector with the four foot of cable. .
After a year the product has held up great!! After one year the product is still in great condition. I am still very happy with this product. Do you have a question about this Wiring? The Bargman 7-Way Super Sealed Connector # 50-87-004 you received actually uses the standard wire coloring for camping trailers. The color code is labeled on the front of the 7-way's cap to try and make it easier. We always recommend to connect wires by function instead of by color since there are more than one standard and often times those are deviated from completely. I've attached a picture of an RV standard 7-way that's common on camping trailers and is what the # 50-87-004 uses. I would recommend you cut off the 6-way you have at the rear of your truck and then install a # 50-87-004 in it's place. I attached a couple wiring diagrams for the two styles of connectors so that you would know how to wire up the new 7-way with the wires from the 6-way. You will need a 2 inch hole in order to mount the Bargmann 7-Way Super Sealed Connector, # 50-87-004. I have attached a diagram which illustrates the exact measurements of the connector. 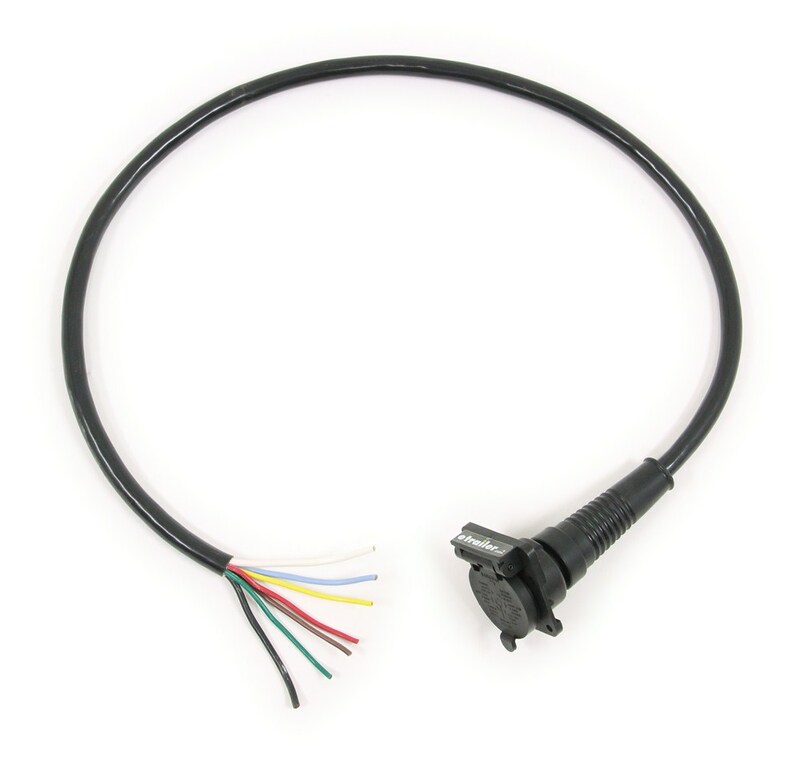 For a 7-way with a wire lead we have the part # 50-87-004 which you could put on your tow vehicle. 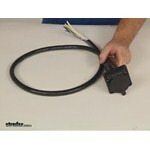 Then for a 7-way for you to wire to your trailer we have the part # H20042 that also has a plug and wire lead. 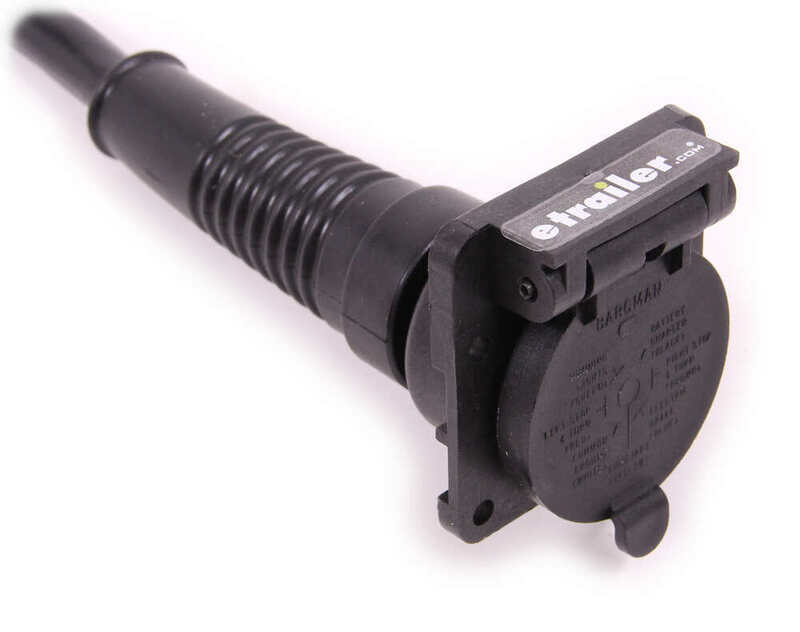 Yes, the 7-Way Super Sealed Connector w/4' Cable Vehicle End part # 50-87-004 that you referenced is compatible with standard 7-way sockets like the Pollak # PK12706. A 6-Way to 7-Way adapter is not all that common but we have a few. But they are not 2 feet long. The closest we have is # 47435 which end to end is around 12 inches but the wiring part between the 6 and 7-Ways is 6-1/2 inches long. What you could do is use # 50-87-004 which is 4 feet long but can be trimmed down to 2 feet. You would just need to add a trailer side 6-Way, # PK11604. You are going to need to replace the 7-way with a standard one since what you have is a non-standard connector that we don't offer anything for. For a 7-way that comes with a plug and lead you would want the part # 50-87-004. Then for a 7-way to 5-way adapter you would need the part # A75TB. The Bargman Silicone 7-Way Plug 54006-010 that you have is a standard style 7-way plug that the # 50-87-004 that you referenced is designed to fit. I can't say we've seen this issue before so would it be possible for you to send me pictures of the connectors you have on both your truck and trailer? Just a note to let you know I did receive the hitch and wiring harness. Nice to deal with you. Thank You very much.